Club Amps are usually built-to-order, but there are times when we have demos or prototypes for sale. This is where you will find them listed. They will (usually) be in brand new or very good condition, guaranteed for a year. 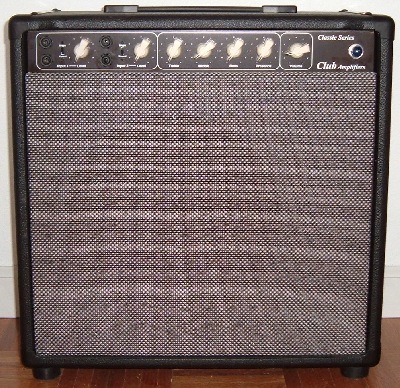 This amp was the subject of an article in Guitar Player Magazine. It's been a flagship demo used at San Jose Jazz Summerfest, Fountain Blues Festival and the Monterey Jazz Festival. It has a Blues output transformer, 5881 output tubes, 5AR4 rectifier and a Guitar Speaker Warehouse H30 clone speaker. 50W-60W uncommitted chassis with "The Standard" output transformer. This chassis is in process to be completed as a reverb chassis. We have one EL34 60W 1x12 combo with Celestion V-type speaker in final completion stage. The 50W 1x15 Reverb amp built for Larry Coryell is available for sale. This amp features 6L6 out tubes, a custom Eminence 15 with a massive AlNiCo motor, and tube driven reverb. We refer to this as a "whisper-verb" amp. The reverb is very gentle. It's not surfer-dude reverb. You can see the amp on our home page with Larry playing at Kuumbwa Jazz. It has sentimental value to me, but I will let it go for $2600.00. There are half a dozen each 1x12, 1x15 and head cabs built and waiting for a chassis and speakers. There are 3-1x15, 1-1x12, 4-2x12 and 2-2x10 extension cabs ready to ship. Email for speaker options and/or details.